There are a lot of benefits to looking for tables and chairs rental services that also offers tents for rent for your birthday party. In a tropical country such as Singapore, having tents to shelter from the Sun is convenient as it provides a cool and comfortable space. But, more than that, tents add a layer of fun to your party that helps set a festive tone for your celebration and give it a more vibrant vibe. Have you ever been to an outdoor party that had very little tents before? It was stressful, wasn’t it? As beautiful as the outdoors can be, Mother Nature can turn on you rather quickly, which turns the party into a game of “will it rain or not?” With a tent, you can rest easy knowing that the rain won’t be causing that much of a problem. With thoughtful planning, such as a sheltered walkway, enclosed tent, flooring, and proper guttering, guest can enjoy the luxury of an indoor environment in an outdoor setting. Having fun out in the sun is near impossible when it’s too hot outside. And, even if the birthday party is on the beach, nobody really wants to be exposed to the hot sun for too long. Choosing the right tent specification can make a big difference in ensuring optimal guest’s comfort level. It is good to check with the tentage provider whether the tentages have an opaque and heat-resistance roof; and if budget allows, turn it into an air-conditioned tent. In this way, every aspect of the guest’s comfort will be taken care of, while the planned activities continue. Tents aren’t just for function either. You can use the tent to help liven up space and improve the look! 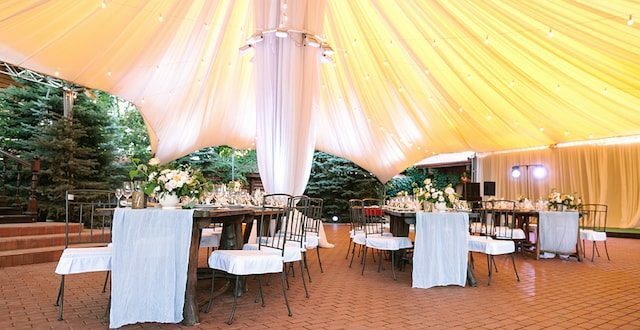 What you thought was once an open, barren backyard could be transformed into a venue filled with all sorts of lighting, so long as you let your creativity loose, which is something that you can definitely do with tents! If it fits, renting a large dome tent in Singapore gives you a lot of room to decorate. If you combine this with windows and other ceiling treatments, then the event space will be all the better for it. You can even add in lights, plants, and flowers if you want to improve the look of the space. Tents are awesome for decoration and protection from the elements and all, but one underrated reason why you should think about renting a tent for your birthday party is the privacy it provides to your guests. Open and outdoor spaces, as is, can feel very spread out, leaving many guests to feel isolated and not part of the party. But, with a tent, you have a defined area that guests can congregate and mingle in, making the party and setting more intimate without making the guests feel constrained because you’re still out and about in the outdoors! For birthday parties, this is just perfect because you have created your perfect little space that meshes your event with the outside world. As you can see, there are plenty of benefits to renting a tent for your birthday party. To save up on costs, look for a tables and chairs rental company that also rents tents so you can ask for a cost-effective package deal. Share the post "4 Benefits of Renting Tents for Your Birthday Party"
It sure was nice when you said that renting tents can help you to make sure that your guests will enjoy your party without worrying whether will it rain or not. My husband and I are organizing our son’s 7th birthday party. We’d like to have it done in our yard. We don’t want his guests to get sick when it suddenly rains during the party, so we’ll consider renting tents and other party rental furniture. It was helpful when you said that renting party tents can give you a relief because you won’t have to guess if it will rain or not. This is a good tip for me because I’m organizing my son’s birthday party. My goal is for the party to be held in our yard. What I want is to ensure the comfort of my son’s friends no matter what the weather is, so I will find a party rental company soon. It really is surprising that tents aren’t used more often for birthday parties, especially with the benefits that they can provide. As the article points out, one of their bigger advantages is that they can really liven up a space. After all, you can decorate them with all kinds of lights and balloons in order to improve the look of your party. You got me when you said that you can have peace of mind when you use tents at your party because you won’t need to worry about whether will it rain or not. My husband and I are planning to have our son’s birthday party done in our yard. We don’t want to panic when it rains during the party. Additionally, we want the party guests to feel comfortable, so we will consider renting tents. You got me when you said that renting a tent will help you to make sure that you won’t need to worry about the rain. My husband and I are planning to hold our anniversary party in the yard. We want to make sure that our guests are going to be comfortable no matter what the weather is. We’ll do all your tips because we’re also planning to rent chairs and tables.